The large raptors Deinonychus 7 - 13 feet long and Utahraptor 22 feet long show up in the North America in the Early Cretaceous. Both are more like the Jurassic Park raptor than the actual Velociraptor from Mongolia. 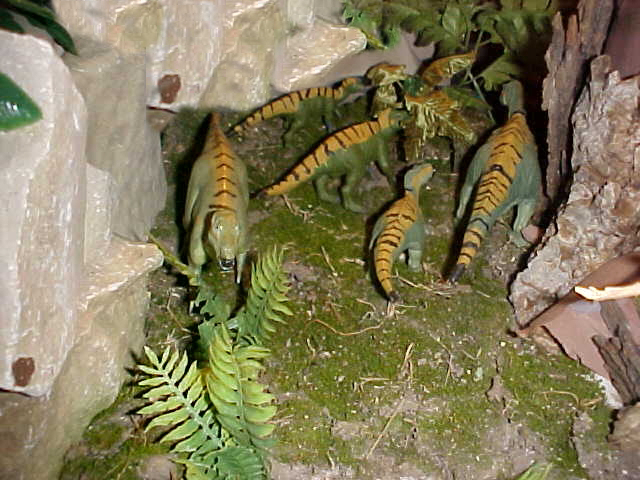 Iguanodonts are a group of herbivorous dinosaur leading up to the duck-billed dinosaur. The only well-accepted North American species is Dakotadon a genus of iguanodont dinosaur. It was described from a partial skull from South Dakota. once assigned to Iguanodon as I. lakotaensis. There are fossils that may record mortality of herding animals migrating through rivers. There is a span of individual ages among the fossils that looks like a herd. Basal, or non-hadrosaurid, members of Iguanodontia are among the most widespread, diverse, and numerous dinosaurs in Early Cretaceous terrestrial deposits. Camptosaurus depressus and Dakotadon lakotaensis , Tenontosaurus, Hippodraco and Iguanacolossus basal iguanodonts from the Barremian–Aptian of western North America are more basal than contemporaneous taxa from Europe and Asia. Basal iguanodontian dinosaurs were extremely successful animals, found in great abundance and diversity almost worldwide during the Early Cretaceous.